Show your students they are a Star by awarding all four (4), Core Subjects Certificates!Bundle of 4 Includes:-Mathematics-Language Arts-Social Studies-ScienceBONUS! CITIZENSHIP AWARD!Use at the end of every quarter, semester or end of the school year! 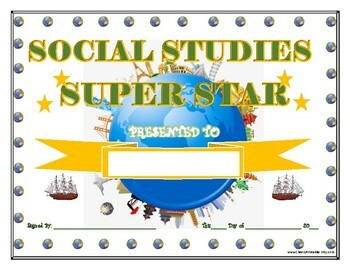 Show your students they are a Star by giving them a Social Studies Super Star Certificate!